I love soup. Its so popular in the fall and winter, and there is no reason not to bring soups into springtime. 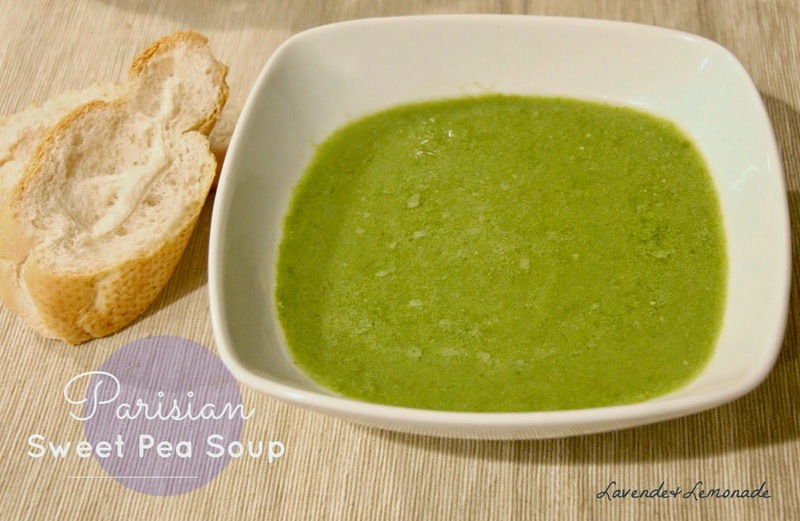 This Parisian sweet pea soup is so beautifully simple, uses ingredients that are probably already hanging around the kitchen, and is absolutely delicious. A winner for weeknights, and it can be dressed up to make a nice dinner party starter course. Fun fact: This soup is traditionally known in France as a Potage Saint-Germain. Melt the butter in a dutch oven or heavy saucepan over medium heat. Add the onions and cook for about 3 minutes, until they're soft and transparent. Add the water and the peas, bring to a boil then reduce to a simmer. Cover, and let cook for about 15 minutes - until the peas are tender. Use a hand mixer or a blender to puree into a smooth soup. If you're feeling ambitious, put a fine strainer over the pan (to catch any larger fibers or shells) and pour the soup back into the pan. I usually skip this step...I don't mind a more granular texture and am happy to save time and dishes for a weeknight dinner. Stir in the salt, pepper, and whipping cream and serve with crusty bread. That sounds marvelous! It's something I've never tried and I'm excited! I never had pea soup before and this looks so good! I gotta try this, thanks for the recipe! I have never had anything like that, but it sounds delicious. i like split pea soup! add in a little diced ham and i am good to go! I never knew how simple this soup was! Pinning for our next meal! I've never made pea soup before, but I do like it on occasion. This seems like a very easy recipe to follow. I like pea soup and I've never made it. This is very easy and seems like it will be easy for me to make it vegan, too! Sounds like a really delicious pea soup! I need to try this out! I love a good pea soup--sweet and fresh this time of year. I like sweet pea soup. This looks like it could be really tasty!